Here we have a fabulous Antique Print of a Regency Period Evening Dress! This is another charming Regency Fashion Ladies Print, from the series that I have been sharing over past couple of weeks. Shown above is a lovely Jane Austen-esque print that you can download for Free! The print dates to around Circa 1800 and shows a woman wearing a gorgeous fancy White Dress, with some amazing White Roses all along the hem! Such a wonderful early Fashion Print! 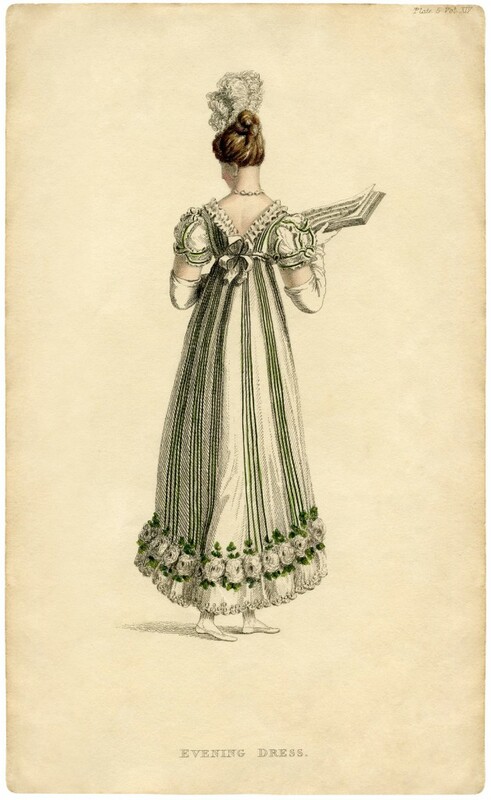 Also, you might also like a similar Regency Era Fashion Ladies Print from HERE. She is lovely, Karen ..Thank you!